Connecting and empowering people to enhance productivity by offering improved and simplified tools to create and manage sites and associated content. Microsoft SharePoint 2010 integrates smoothly with Microsoft Office 2010 which makes it possible for users to be more productive while using a more familiar set of tools to interact with SharePoint Server. Unifying infrastructure to cut maintenance and training costs by providing an integrated set of features and the ability for organizations to build their business productivity solutions on top of the SharePoint Server. Responding rapidly to business needs by providing the ability to quickly build and deploy dynamic solutions to end users, power users and professional developers. SharePoint 2010 provides the tools to easily create business solutions that can be integrated with existing data and process. SharePoint sites are websites that aim to be an entry point to the World-Wide Web. They typically offer search capability and links to useful pages, news, or other services. SharePoint sites can be organization-wide or global, e.g., MSN, Yahoo, and Google. 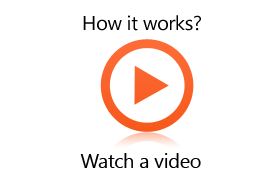 SharePoint 2010 offers: a rich user experience, support for multiple browsers, mobile based interaction with people and content, MS Office integration, and collaboration across the internet, intranet, and extranet for creating, editing, and managing sites. Organizations produce various types of content including documents, records, and web pages. SharePoint 2010 offers great ways to manage different types of content while maintaining strict control through governance policies to ensure compliance. 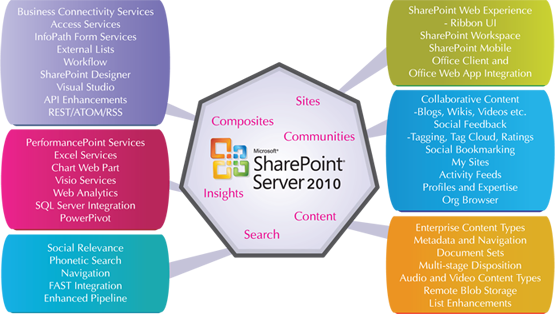 Key features that make SharePoint 2010 an ideal tool for creating, authoring, publishing, and managing content are: integration with Office applications, offline client experience, speedy and easy web publishing, and the ability to create and manage custom content types and Meta data. Provide a simple, familiar, and consistent user experience across multiple platforms. SharePoint 2010 makes it easier to find data including content and people. It does this by providing enhanced search capabilities, the ability to plug in “FAST” searches for SharePoint, connecting and indexing data from external sources, and phonetic search. SharePoint 2010 enables collaboration and analysis to help everyone in the organization get richer insights by offering excel services, new visualization, navigation, and BI features. These features greatly facilitate and speed up the business decision-making process. SharePoint 2010 serves as a platform to build and deploy business solutions for all types of users by providing powerful tools like SharePoint Designer, InfoPath Form, and Microsoft Access Services. Business connectivity services in SharePoint 2010 offer a nice way to create, read, update, delete and search line of business (LoB) data. SharePoint 2010 offers the flexibility of an in-place upgrade from SharePoint 2007 as well as an upgrade through data migration. An in-place upgrade is suitable for small environments where the existing setup of SharePoint 2007 already satisfies the infrastructural and software requirements for the upgrade. A more serious approach for the upgrade is to deploy SharePoint 2010 and then run the data migration/re-configuration process. Careful planning is required before performing a migration upgrade. Starting with satisfying the hardware and software requirements, the process goes on to selecting a suitable approach for the upgrade, proactively identifying and resolving any issues that may hinder the upgrade process, backing up content and configuration data, executing the actual migration process, re-configuration/upgrade of services and finally performing the post-upgrade verification checks.